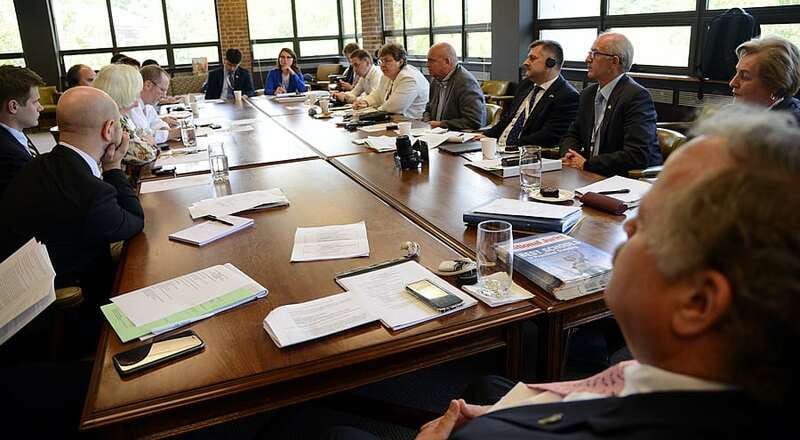 The USAID New Justice Program, in support of positive changes in the Ukrainian legal education system, sponsored a visit by a group of Ukrainian policymakers and legal educators to the U.S. to study how legal education operates in a robust democracy. W&L was one of three law schools the delegation visited while in the U.S. Other stops included Georgetown Law Center and the University of Virginia School of Law. The USAID program in Ukraine broadly supports the judiciary and government in the effort to create an independent, accountable, and transparent justice system that upholds the rule of law and fights corruption. Prof. Speedy Rice, who helped organize the visit, says that strengthening legal education is a key part of this mission. At W&L Law, the delegation heard from a variety of faculty, students and administrators about the operation of the law school, with a strong emphasis on the internal and external mechanisms for quality assurance of the program of legal education. The group also discussed trends and innovation in legal education, including W&L’s own national leadership in experiential and practice-based training. In addition, the delegation learned how the University’s honor system impacts legal education at W&L and contributes to the formation of professional identify and ethical law practice. The school’s efforts to prepare students for a global legal economy was also a key topic of discussion. Members of the delegation listen via translator. Prof. Joan Shaughnessy speaks with the delegation. According to the USAID project description, the instructional methodologies and core curricula in Ukrainian law schools are still largely unchanged from the Soviet era, leaving law graduates underprepared for modern law practice. In addition, Ukraine’s early free market economy that followed independence enabled large-scale commercialization of higher education, leading to a market surplus of law schools and students. The USAID hopes that legal education reform in Ukraine will lead to an improvement in the professional knowledge, expertise, and values of those entering the legal profession, which in turn will strengthen the justice system and promote public trust over the long term.